Contact us by phone, email, or letter to book your Hebridean Experience at the Top House on Eigg. 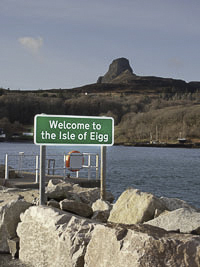 We had a thoroughly enjoyable and relaxing week on Eigg. The weather was OK for Scotland, quite cool, but very little rain and we were out and about every day walking, cycling and swimming occasionally (with wetsuits). The cottage was very cosy and I mastered the fires, keeping the kitchen one going all week. Great collection of books and I enjoyed reading about the history of the island. The locals were friendly and we had a very good meal at Lageorna during our stay. I just wanted to let you know that we had a most magical time at the Tophouse and are missing it so much! The house is absolutely gorgeous – just perfect for us all. We were really lucky with incredible weather and spent every day on different beaches, swimming and making forts…the children were in heaven! A rather belated note to say how much we enjoyed the Tophouse and Eigg. We wish we could have stayed longer and would love to go back. The weather was very windy and quite wet on Eigg, but there was no day we could not get out and about, and in any case it was more or less what we had expected (for an autumn visit)! We had a very relaxing and peaceful time. You have a lovely and charming place and we very much hope to return in the near future. Many thanks for making the Tophouse available. We have just sent a very happy week here with mostly lovely weather and we have much enjoyed the views., the bluebells and the cuckoos and the water warm enough (just!) to swim in the sea and lakes. I am currently watching the hen harrier hunting in the meadow outside the window. Our American student protégée and her friends were beside themselves with joy about staying here and Maggie has been devouring your Eigg history books. What a lovely place. Many thanks for making the house such a lovely place to stay, from library to the fire going in the kitchen and swings and hammock in the garden (which my son now 16, enjoyed as much as last time five years ago); we all fell in love with The Tophouse and Eigg.